Jared Unzipped: Well Hello There American Toad! 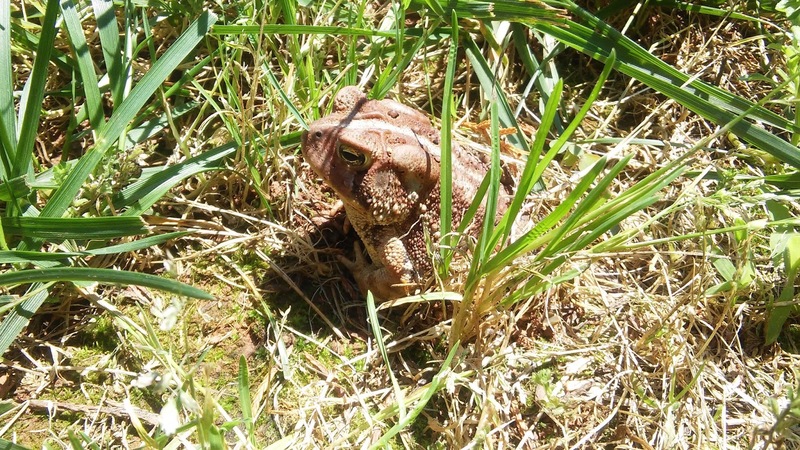 Last month, I wrote about the discovery of a common Fowler Toad living in my back yard. It was certainly a welcomed sight; I'm always eager to invite as much biodiversity as possible into my landscape. With all the dozens of species of birds that live in my yard, also having a cute little toad was quite delightful. Today, I was lucky yet again. While mowing the grass around my garden area, I happened upon this stout American toad (Anaxyrus americanus). Sure, it's just a toad you might say. And yet, this specimen was hefty, roughly the size of my palm. I didn't want to touch it for fear of stressing it out, but I did guide the toad towards a more inviting residence within a garden bed filled with Asiatic lilies. There, it would be safe from my mower. I took note of the area surrounding the American toad. All around were various insects and worms, of which one was crawling out in the open nearby. I suspect the toad was hunting for some lunch. Who can blame him? I'm certain he found a tasty earthworm or grub to snack on while resting among the lilies. 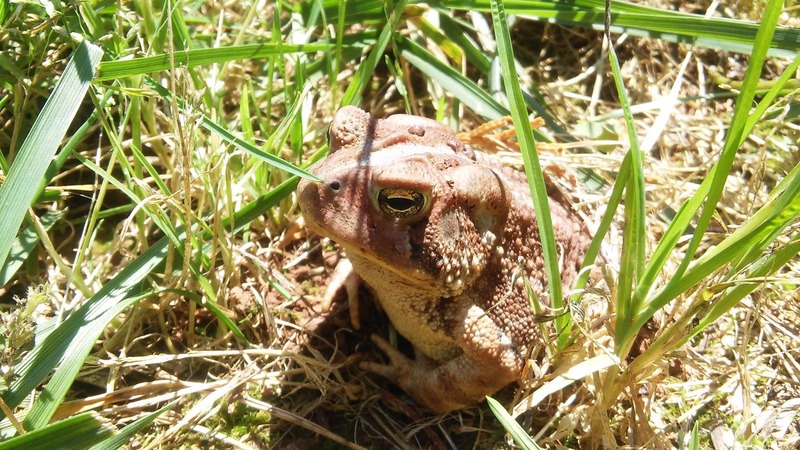 The American toad is a certified success story within the animal kingdom. It has spread all over the North American continent, ranging from the Atlantic coast to the Midwest, then northwards into Canada. They're of the hardy and resilient sort, easily adaptable to almost any environment -- flatlands, forests, mountains, open fields, brush-filled areas and yes, even back yards. With a secure hunting ground for food and a stable hibernation area for the cold winter months, the American toad can live a long and happy life. The oldest known American toad lived well into her thirties. Typical though, an American toad can easily live for 5 - 15 years in the wild, with life expectancy much longer in a healthy captive environment. Just think... the toad I met today may have lived in my yard longer than I've owned my home. 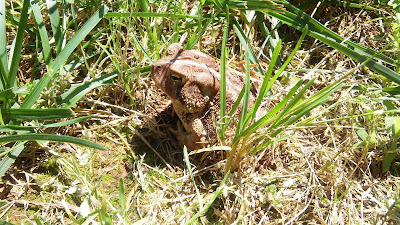 Perhaps the toad looks at me and thinks "gee, who is this guy on my property?"